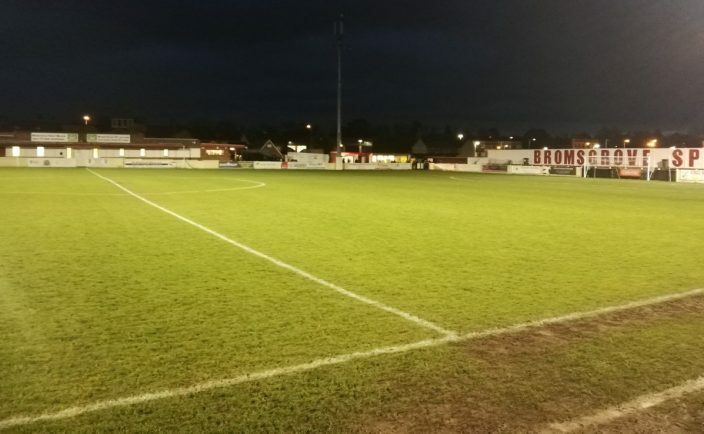 A FLOODLIGHT failure during half-time denied Bromsgrove Sporting the chance to secure victory over ten-man Didcot Town. The Rouslers were 3-1 up and had the man advantage going into the second period but proceedings were brought to an abrupt end before the next 45 minutes could start. Safety officials confirmed there was a technical issue with one of the four floodlights, adding the referee deemed it unsafe to continue with a small corner of the Victoria Ground not in full light. Club secretary David Stephens told the Standard the game – in full and 11 versus 11 – must be replayed within 42 days. Yellow cards and red cards from today’s (Saturday) game, though, stand as normal. Frustration within the Sporting ranks was clearly visible as they were in a commanding position to take the three points and maintain pace at the top end of the Southern League Division One Central table. After a balanced opening period, Sporting took the lead in the 12th minute, with Richard Gregory thumping home a thunderous 25-yard effort which flummoxed Didcot keeper Leigh Bedwell. Three minutes later Sporting doubled their lead when skipper Craig Jones headed home from a corner before Jason Cowley got in on the act with barely 20 minutes gone with a neat lob over Bedwell for 3-0. Didcot reduced the arrears on the half-hour mark when an unmarked Luke Carnell headed in Greg Hackett’s corner from close range before Cameron McNeill came close to reducing the gap even further just moments later but his fizzing left-footed shot flew past the far post. McNeill was then given his marching order four minutes before the break for a rash challenge on Daniel Morris. However, this did not faze the visitors who came close to making it 3-2 on the stroke of half-time but Carnell could only volley over from Adam Learoyd’s header back across goal. That proved to be the last of the action before the floodlight failure brought an end to proceedings. Next up for Sporting is a Worcestershire Senior Urn semi-final clash against Worcester City on Tuesday night before a return to league action on Saturday, December 8 when Peterborough Sports come to town.